A new book on the history and science of 1080 in New Zealand goes beyond simply relaying facts and instead delves deep into science denial and the psyche of those who favour conspiracy over science. Protecting Paradise: 1080 and the fight to save New Zealand’s wildlife, written by Dave Hansford and published by Potton & Burton, covers the gamut of one of New Zealand’s most controversial subjects. From the history of 1080’s development and use, a thorough walk-through of the science and advancements over the past few decades, its controversies and opponents and where we’re heading in the country that hopes one day to call itself “predator free”. Hansford writes features and a regular column for New Zealand Geographic and environmental commentary for Radio NZ. He brings his superb writing style to Protecting Paradise, which means this isn’t a trudge through heavily annotated scientific literature but a highly enjoyable read. Take this passage, explaining how New Zealand came to be stranded in the Pacific with next to no native mammals. Hansford could have written a perfectly good book just by sticking to the controversy, some humourous anecdotes about the anti-1080 campaigners and some solid science. Instead, he’s gone deep on scientific literacy, how the media can help or hinder facts on controversial issues, and what compels people to dismiss science in favour of conspiracy. It elevates the book beyond just a history of 1080 in New Zealand; rather, it’s a useful reference for anyone working in science communication, media, education and policy. Yes, he does debunk the myths perpetrated by opponents, and he does this with vigorous-yet-clear writing and excellent interviews and references. What really came through for me was how seriously Hansford has taken this. It isn’t a gleeful attack of opponents, rather a considered and respectful discussion of a serious topic. More often we’re hearing about life in a “post-truth” world, where science denial and anti-intellectualism rules. The furore around 1080 is but one example alongside vaccination, climate change and community water fluoridation. We could use more writers like Hansford tackling these issues in an even-handed and well-researched manner. As he points out, science deniers exploit the reality that most people don’t have the “time or inclination” to find original scientific material to confirm claims for themselves. But he’s made the information easily accessible in Protecting Paradise. It won’t change the minds of those dead set against the use of aerially applied toxins. But Hansford is under no illusion that he could hold that kind of sway (and seems to deliberately needle the group at times, especially in publishing named quotes from those spouting their views on open Facebook forums). But if there’s anyone still sitting on the fence, wondering how on Earth they’re supposed to balance out the science against the propaganda – this book will be a great place to start. 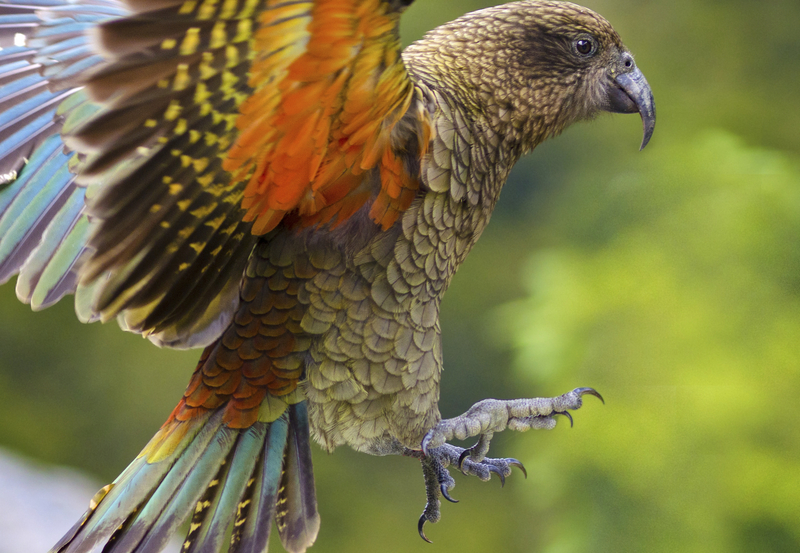 We have a bundle of wonderful natural history books published in New Zealand. But it’s not often we have such thoroughly researched, in-depth science writing. It’s evident the time and passion Hansford has exerted on this book – the interviewees read like a veritable who’s who in New Zealand ecology, pest control and science communication. 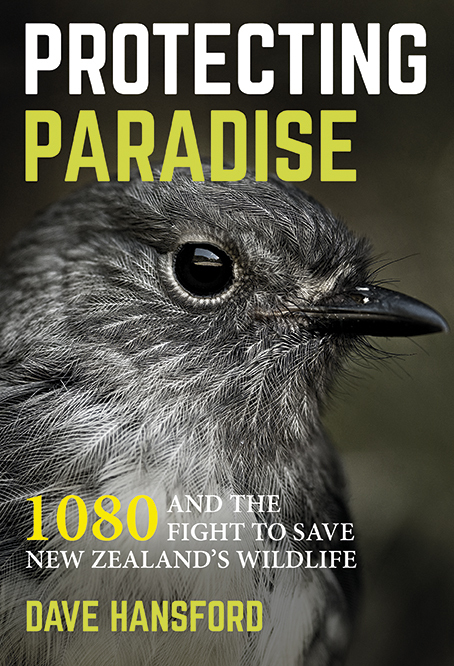 The result is a book I’m certain will be welcomed by many New Zealanders, especially those in science and conservation, and hopefully reaches those who still think there is a debate about the science of 1080. Great review, and really looking forward to reading this. I noticed one mistake in the quote, though; there were already mammals – monotremes – in Australia by the time Zealandia split, and we have a NZ terrestrial mammal fossil as late as 19 million years ago, so that can’t be the reason we only have bats today. ‘Thoroughly researched’? Quoting posts on Facebook ? Is this review some kind of warped joke? i’m part way through reading this book, and I agree with Sarah-Jayne’s review and disagree with Mary. I’m impressed by Dave Hansford’s balanced and even-handed coverage. For instance, he mentions instances where 1080 has had harmful effects on native birds. I’d suggest that you would never find an anti-1080 activist prepared to acknowledge evidence contrary to their views. It’s one of the hallmarks of a scientific approach that you should be prepared to change your mind in response to evidence. I also don’t have a problem with Hansford citing Facebook posts from the anti-1080 brigade. People should be accountable for their views. It sounds like he tried to interview them but they refused. Mary if you read it, you’ll see that it is well researched. Yes it quotes some stuff from Facebook, but the two are not mutually exclusive.